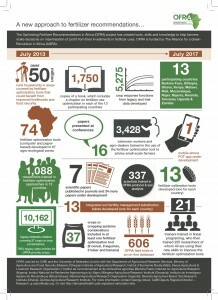 Dannie Romney, Africa Soil Health Consortium project executive, took an opportunity to review the progress of the Africa Soil Health Consortium (ASHC) as it reaches the half way point in the current Bill & Melinda Gates Foundation grant programme. She shares the teams views on the achievements, lessons and challenges from the past two years. ASHC is a CABI-led programme. It consists of a series of funded projects delivered in partnership with some of the most respected organizations in East and West Africa. 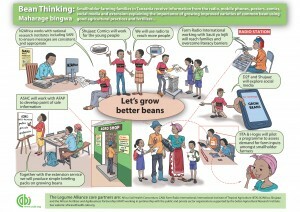 In May 2014, the B&MGF awarded a grant of $4.6 m. This supported communications experiment, based on the idea that communication campaigns, presenting different combinations of media (print, radio, social media & film) and approaches such as extension & training days, would be an effective way of changing attitudes and behaviours in small-scale farming households. This was based on the assumption that different members of the family, men, women, younger and older people access information in different ways. The project is required to deliver change at scale and also record and share the learning journey. The blogs we produce are part of our commitment to sharing ahead of learning papers and journal articles being published. To date CABI, and the delivery partners working with us, have raised over $4m matching funds to expand the portfolio of communication activities. Within the work programme the ASHC partners are also supporting large partner programs seeking to deliver information campaigns at scale. This includes communications support for over $50m of live B&MGF-funded projects and over $5m of AGRA-funded projects. ASHC continues to explore ways of pulling-in co-investment and shaping delivery of partner programs, based on it’s experience and evidence of what works. Reaching farmers 2.2 million farmers: The reach of ASHC partners to date is estimated at approximately 2.2 million farmers. 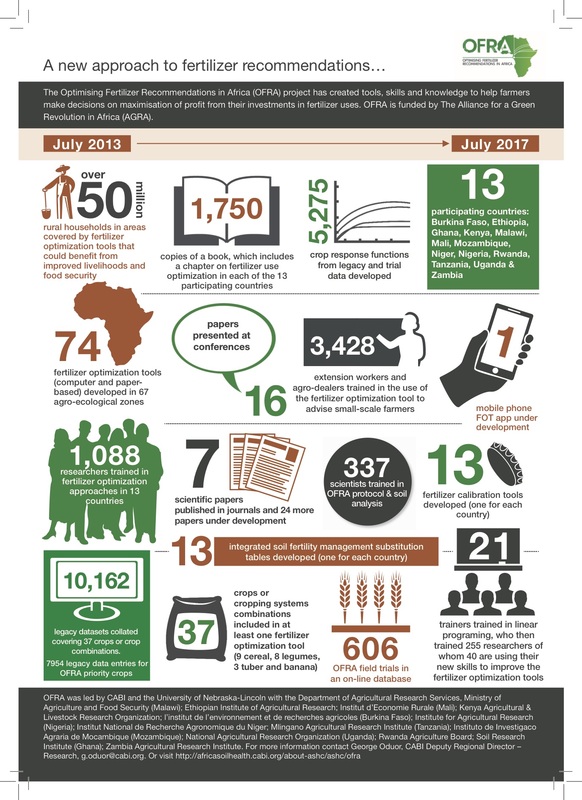 This includes 1.42 million via radio supported by Farm Radio International (with not all potential audience figures yet logged) and half a million via comics produced by Well Told Story (0.9 m comics have been distributed). This is complemented by more targeted approaches reaching a quarter of a million via SMS, or distributed print or inter-personal approaches. SMS increase maize sales: 45,000 maize farmers in the Southern Highlands of Tanzania were sent SMSs on maize production. Commercial seed companies and Uyole Agriculture Research Institute provided content and feedback from the ground. The original message script was amended to respond to emerging events including delayed rains and an outbreak of stalk-borer. Preliminary feedback indicates increased seed sales and farmers better able to prevent crop loss. Capacity built: ASHC partners are good at building capacity of national partners/sub-contractors leaving them better able to respond to the needs of the agricultural sector in future. Countrywise Ghana can now offer a value-added service to clients through data collection for feedback loops. Countrywise also re-invested fees to increase the number of tri-cycles used for screenings to three. ASHC was one of the early investors in Shujaaz in Tanzania and as a result they were linked with a number of B&MGF clients and able to fulfill a grant condition. Esoko established a foothold in the Tanzanian market and has built up extensive lists of farmers. 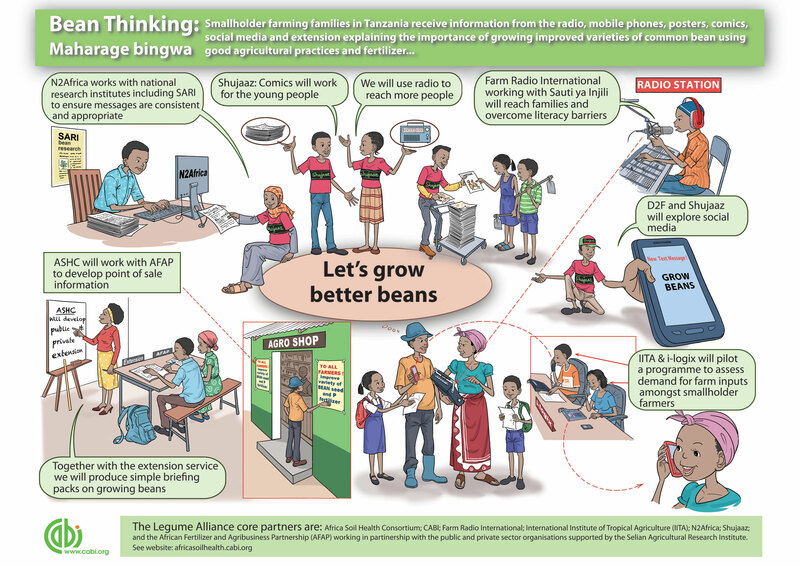 Radio stations working with Farm Radio International (FRI) had subject and broadcast training ensuring their output is fit-for-purpose; input companies in Tanzania and Ghana linked to farmer demand. Green-Ef an agro-input wholesaler has been supported to establish their ability to SMS farmers and also a free-phone product enquiry line has been established. Media gets more social: The ASHC materials library now holds nearly 500 different publications – mainly developed by the ASHC partners. 4,955 downloads were made from the website between July 2016 to June 2017. That is a 70% increase compared to the previous year. 10,369 visits were made to the website in the same period. Comics appear to be changing youth view on agriculture: Well Told Story (WTS) shared information on beans in the youth comic Shujaaz and highlighted potential to ‘hustle’ (make money) from beans. 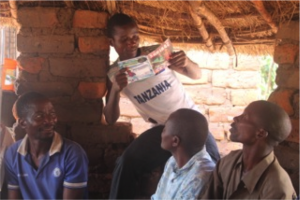 Shujaaz collected challenges in bean production, crowd-sourced using the Shujaaz social network platforms subsequently addressed through the storyline. WTS aims to change negative attitudes of youth to agriculture with positive stories on agriculture. The Shujaaz 2016 survey showed 56% saw agriculture as “…a very cool source of income” and 27% interested to try agricultural ideas – this suggests that attitudes amongst the young are changing. Movies are good for reaching family audiences: Films on soybean production shown at early evening village-based screenings attracted family audiences. Of the 29,555 attending 23% were men, 31% women and 46% young people (under 18). Coordinating integrated campaigns is hard: Handshakes between partners, in which different channel are linked and drive audiences between channels, proved harder to implement than expected. Different partners are used to working independently and to different timetables in the different media cultures. Shujaaz signs-off content around 2-3 months ahead of publication. Radio campaigns have shorter turnaround times so that timings of programs were finalized too late for print deadlines. However, handshakes across media are starting, with SMS used to alert farmers to up-coming programs. This will be an increased focus in the coming years as partners increasingly trust each other as alternate sources of information. ICT-based services: A mobile landscape analysis carried out in Tanzania provided a wealth of information about the direction of m-Agri VAS and learning and provoked the team to identified challenges and opportunities for mobile as a mechanism to share information with farmers. Impact can take many years to achieve: Work on the introduction of inoculant, in a number of countries, has led the team to reflect on just how long it takes for innovations to be successfully mainstreamed and the role of information in value chains. ASHC has seen the need to collect impact data (on attitude and behaviour changes) sooner in its projects, but also to understand that change will take systematic long-term investment. Good graphics have legs: The ASHC team has produced a number of simple but highly effective project graphics. In particular, one diagram explained how the campaign approach worked. Another graphic approach was to summarize projects using info-graphics these are a combination of graphics and text that can allow the key achievements of an entire project to be distilled onto one page. Partners have used these graphics to share our message and we have recently received a request to use one of our info-graphics in an industry newsletter getting our message out to 9,000 key contacts in a way that should grab attention. Private sector co-investing: As trust builds in ASHC, we see co-investment in campaign activities currently within input markets but there is great potential for this to be extended into output markets too. Project leverage: The CABI team has worked tirelessly to leverage new funding and manage a set of projects. This has enabled the programme to achieve far more than originally envisaged, but is not without complications. It requires complex financial management to ensure that matching funds are reported correctly to all donors. Researchers and communication: ASHC has built trust with our international knowledge partners to the point that some of our strongest advocates are from international organisations leading partner projects. Farmer profiling for mobile delivery: A major investment in mobile is collection of farmer profiles. High numbers of farmers were profiled in communities – but the question remains over what would be most cost-effective? It is clear that farmers share information amongst themselves and many initiatives capitalise on the presence of ‘lead farmers’ that are recognised by communities. Would we have had the same effect over a wider area if we had selected fewer farmers in each community but a greater number of communities? In the coming years CABI and partners will aim to think more strategically about the way in which profiling and communication takes place. The work on using SMS to link farmers to input markets has great potential to be extended to cover output markets. 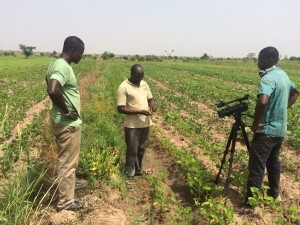 Mobile phone fertilizer app: The work funded by AGRA on Optimising Fertilizer Recommendations in Africa has been augmented with additional fund raising by CABI to create a mobile phone app. This will enable both land optimisation and help farmers optimise their fertilizer investment by encouraging them to place fertilizer on the crops that will give the largest return on investment. Up until now these calculations have required a computer, we expect the introduction of a smart phone will be a game changer. Cross country analysis: ASHC and our partners have developed campaigns for soybean in Ghana, Nigeria and Tanzania in the past two years. This means we can really look at different cultural, political and economic contexts and explore the way information campaigns fit in the context of the situation of the value chains in these countries. Explore serving communities of interest: As we develop our website and social media presence we need to explore how we build our networks and influence. One way of doing this is to explore serving a series of communities of interest and helping them to navigate through the information we hold and that others are developing. This may well be through closer partnership working and information exchange with existing networks.